It’s feeling a little bit like Winter around here at night, or at least as “Wintery” as San Diego can get. I love making soups, and I make them at least once a week – Summer or Winter. 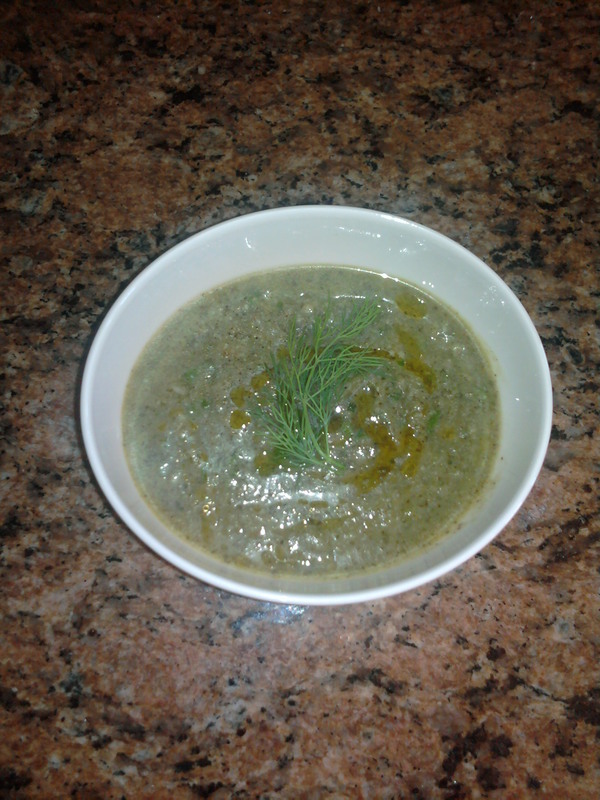 The other night, I made Creamy Cauliflower Soup with Greens (Martha Stewart Living 2012). It is such a simple soup, but it’s so good. I served it with some bread and a salad. If you don’t own an immersion blender, please buy one if you like to cook! I love mine! Making soups is a breeze with one! 1) Heat oil in a large pot over medium heat; cook onion, until soft, 4 to 5 minutes. Add garlic and a pinch of salt, and cook for 3 minutes more. Add cauliflower, and pour in water until it reaches just below the top of the cauliflower. 2) Bring to a boil over high heat. Add 2 tablespoons dill. Reduce heat to low, and simmer until cauliflower is just tender, about 10 minutes. Stir in greens, and simmer for about 3 minutes. 3) Let sit for 5 minutes to cool slightly. (If you have an immersion blender, there’s no need to wait. Just add dill and give it a whirl.) Stir in remaining 2 tablespoons of dill. Puree soup in batches in a blender until very smooth, adding more water (about 1/2 cup or more) if it’s too thick. Return to pot, and reheat. Season with salt and pepper. Garnish with dill, black pepper, and a drizzle of olive oil, and a pinch of sea salt.